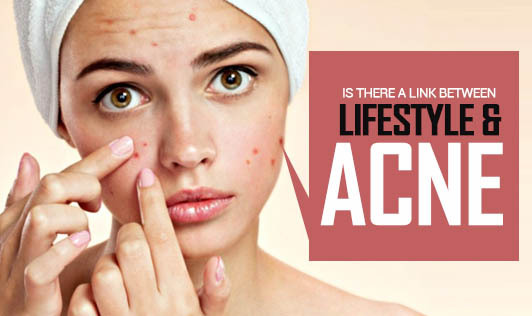 Is there a link between lifestyle and acne? Have you ever noticed that a fresh pimple seems to flare up whenever you have a big event to attend? It's no coincidence that causes these breakouts, stress is the culprit. Clinical studies suggest that acne is related to both psychological and physical stress. Acne and stress are like a vicious cycle, instigating and infuriating each other. But the good news is that you can reverse the cycle by treating acne and stress which can help ease symptoms of both. • Learn to beat stress in a healthy and constructive way. Stress is not just bad for your skin but for your overall health. Hence, it's important to take time to do things that can make you feel relaxed. • A few minutes of deep breathing will help you eliminate the kind of stress that can play with your hormones. • Eat a well balanced diet, this can promote a healthy immune system and can help in battling acne. • A safe amount of sunlight will improve your mood, generate vitamin D and may improve your acne directly too. • Shed the extra weight as being overweight can cause insulin resistance which has been linked to acne and stress. • Drink plenty of water every day; this will keep your skin hydrated and healthy. • A proper skin care routine is necessary. No matter how tired you are, always make sure that you wash your face and remove all the makeup before going to bed. • Get adequate sleep for optimal health and stress relief. Try making these simple adjustments to your lifestyle and you will notice a big difference in a few weeks!